One thing Skylanders has always evoked in my kids is imagination. After a session on the PS4, I’ll usually find them sitting at the table, pens and pencils and paper scattered about like a stationery shop exploded, drawing new Skylanders. I can’t be the only person who thought it would be cool to be able to design your own in the game. Well, in Imaginators, you can do just that. While there are figures to collect, of course, the roster is bolstered by your own bizarre creations. The Starter Pack comes with a “Creation Crystal”, which stores one Skylander of your own devising. Quite unsurprisingly (this being a Skylanders game, after all) when you’re told there are endless combinations, that’s exactly what you get. The sheer number of different parts is dizzying. You can create the entire character, head, chest, arms, legs or tail, armour, weaponry, voice, intro music, catchphrase – and you’re constantly (and I do mean constantly) unlocking new loot in the form of “Imaginite”, which you find in chests and break down into items of colour-coded rarity, RPG-style. Just scrolling through the “Heads” menu reveals dozens of unlockables, and you’ve got all those other body parts and elements, too. The only problem is that you’re limited to one saved character per crystal – which isn’t going to be cheap in the long run. Each Imaginator has a “class” which you choose from 10 options including a Brawler, Swashbuckler, sorcerer and Archer; unfortunately, the class locks to the Crystal, which means you can alter anything about your Imaginator except that. Again, the idea here is that you spend more money on more Crystals, and it’s a little disappointing when you only get the one Creation Crystal with the pack. As far as the gameplay goes, this is Skylanders, so not a great deal has changed, but there are a handful of tweaks and additions that make it all worthwhile. Kaos has reappeared, stealing a book of ancient Mind Magic with which he can create his own Imaginators called “Doomlanders”. The plot, as colourful and half-baked as it is, revolves around you defeating them all and eventually thwarting Kaos once again. Alongside your Imaginators and retuning characters like Spyro, Captain Flynn and Persephone, you have Senseis, powerful Skylander masters who can impart their wisdom (read: special moves) onto your creations. I was lucky enough to play the edition that launches with Crash Bandicoot and Dr. Neo Cortex as Senseis, alongside King Pen and Gold Queen. At brass-tack level, the gameplay is utterly familiar. You traverse various worlds solving simple environmental puzzles and arena fights, searching for secrets and hoovering up collectibles, until you reach the boss of the area, whose defeat usually rewards you with something cool. In the meantime there are various mini-games to distract you, most notably a new game to replace Skystones. The movement feels like it always did, but the combat seems to be faster – perhaps because of the stronger focus on fighting. The standard attack, special technique and sliding/ranged attack are joined by a super technique activated by pressing R2 when the gauge is filled, which unleashes a devastating barrage that damages every enemy in its radius. There’s very little tactical depth, but obviously the different Skylanders have different styles and attacks to keep it fresh. While the Superchargers aren’t featured in the main story, you can take your vehicles into the Racing mode on the main menu. On the face of it, it’s very Mario Kart-lite, but there are tons of courses and lots of unique loot to unlock on the track. Besides which, it’s nice to be able to do something a little bit different while continuing to get value from last Series’ figures. And it all looks so lovely. 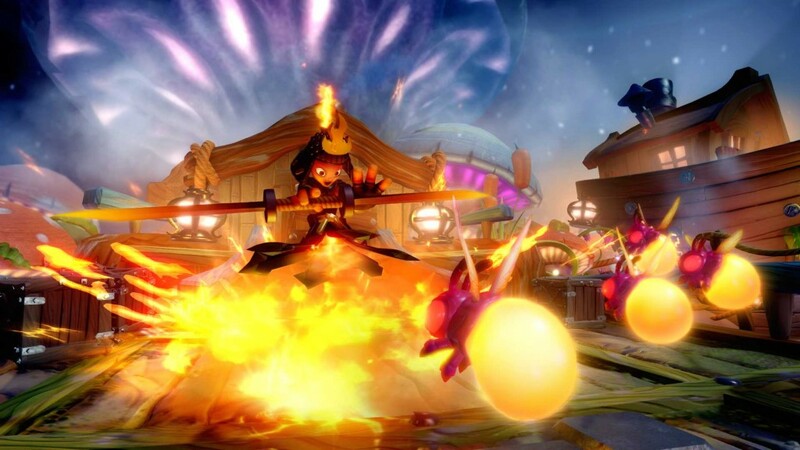 Skylanders has always been a pretty franchise, but Imaginators is almost relentlessly colourful. The environments themselves are striking enough, but the special attacks light up the screen and the cutscenes are fluid and boldly drawn. It may well be geared to appeal to children first and foremost, but Skylanders Imaginators is one for all ages. Whether or not this is the best Skylanders yet is up for debate. For me, it almost certainly is, simply because the Imaginator is such a cool idea and there’s so much loot to collect. 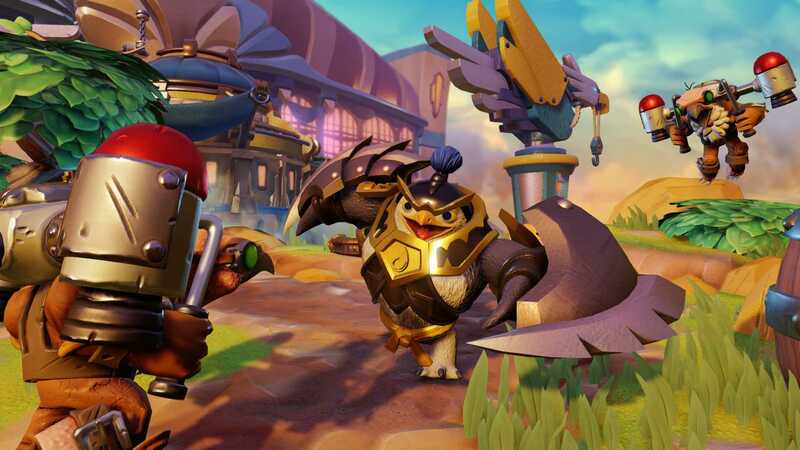 How you feel about the new Sensei characters is up to you, but you can use almost every other Skylander figure with the campaign if you have a favourite from previous instalments – and if you fancy a change from the campaign, you can always head off to the raceway or spend time exploring the Hub. Imaginators may not do anything wildly innovative, but it’s a huge, bright, and endlessly charming adventure filled with things to do and stuff to unlock. A huge, bright, and endlessly charming adventure filled with things to do and stuff to unlock.